In case you've been living under a rock for the last month, I thought I would post about the Planet Earth series the Discovery Channel's been running since March. Tonight is/was the culmination of this 11-part series in which high-def cameras and non-obtrusive methods of filming were used to create this amazing eye-candy of a mini-series. So far, my favorite is the Great Plains series, although I haven't seen the one on Mountains yet. Two new episodes are airing tonight, on Forests and Caves. If you don't have times to watch the episodes, you can see some great photos here. Happy Earth Day and I hope you get to watch at least some of this series. It really is amazing.
" …I guarantee you as you look back on your life, what you’ll remember are not the great successes and great experiences, but the great relationships you have. And yes, you’ll have memories of places you’ve seen and things you’ve done and goals you’ve accomplished. But those moments that you remember best as the greatest moments of your life are the moments where your relationships are working and there’s acceptance and belonging and intimacy. And those moments you’ll remember as the dark part of your life are not because you’ve had great failures or because everything fell apart with your career. But those moments you’ll remember as the darkest moments are when your relationships disintegrated and fell apart because of the choices you made." I spent Sunday afternoon in our family farm's shop, refinishing a dresser I found at a local antique store. I'm a farmer's daughter, yes, and certainly what some would call a "country girl". But most who know me are surprised when they find this out about me. Maybe it's because my vocabulary doesn't include double negatives, or maybe it's because I don't like country music. Who knows. I've heard of people who use painting as a form of worship, but I've never seen it done. This is really lovely. 4. From: New York, New York...To: Paris, France. 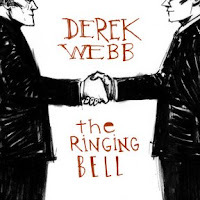 ...21 to be exact, until the release of Derek Webb's new album, The Ringing Bell. But doing just enough to torture (just a little) and tease (a great deal) is a site set up to not only hear the entire thing, but to see the book that's packaged with it. The music is a completely new direction for Webb and I'm giddy like a school girl. This album rocks.